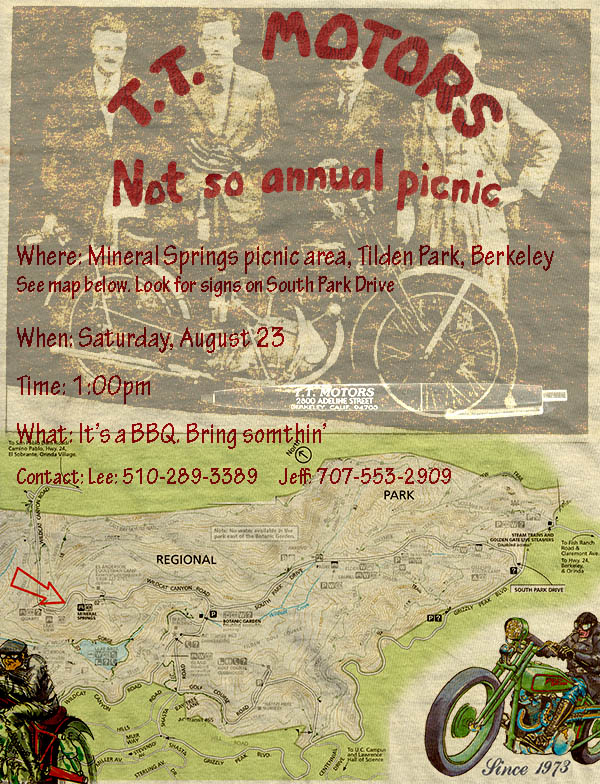 Robin Williams said, “If you can remember the ’60’s, you weren’t there.” Well, if you can remember TT Motors from Berkeley in the ’70’s or ’80’s, you might have been like me, safely on the outskirts of the motorcycle scene at that time. I would gaze longingly at the bikes on display, weekly, before grocery shopping at the Berkeley Bowl. Sometimes I’d converse with local characters like Paladin. Just think, if I’d spent more time inside the shop, I might have met Jeff decades earlier. Anyway, if you were involved, the above flyer will trigger something like a memory. And yes, the gathering is real and in 2014. This entry was posted in Uncategorized, Velocette & other British Motorcycles and tagged Lanora Cox, TT Motors, vintage motorcycles. Bookmark the permalink.